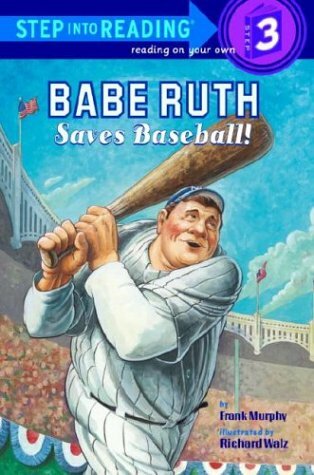 Babe Ruth Saves Baseball! isn’t really a biography of the Bambino, instead it’s the story of the impact The Babe had on the game in the early 1920s. The book is loaded with fun, colorful illustrations help tell the story of how Babe Ruth became the greatest homerun hitter in baseball, and how, after the 1919 Black Sox scandel, his larger than life personality and towering homers kept people interested in the game. The book is historically accurate, and gives some great insight into what made the Babe tick, why his switched from pitching to hitting, why Yankee Stadium was called “The House the Ruth Built,” and just how popular the Yankee slugger was all around the country. This one was my 5th book of the summer as I shoot for reading 90 books in 90 days over break. Keep following along here as I shoot for my goal. hi Mr. Curtis, I just read 3 picture book to my little brother! They were Who Stole the Cookies In The Cookie Jar,P.J. Funny Bunny, and There Was a Coyote Who Swallowed a Flea. How is Andy doing on his 90 books? Great job Gabby. Andy has got 9 books so far, and he’s reading #10 right now. Awwwwww. What a good big sister. Keep it up, you’ll easily get to 90 that way. I’m just about to finish a really good book, so watch for a new post about that one coming up today or tomorrow.